One of our advisors shared the story of how she used Riskalyze to convince a “silver bug” to stop adding to his position in the precious metal. This client’s Risk Number was a 45, meaning that he could tolerate a 9% drop in his portfolio within a six month time period. 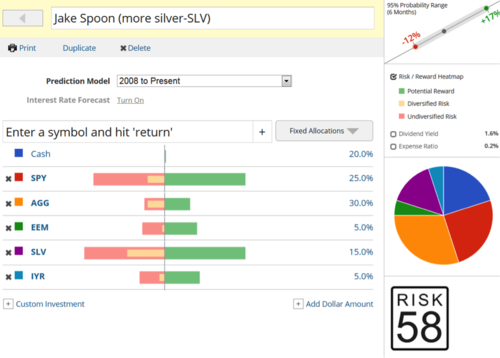 The advisor knew that adding more silver to the client’s portfolio would drastically change the risk in the portfolio, but the client kept saying that he knew it was “a sure thing.” So the advisor used the Six Month Probability Range and the Risk/Reward Heatmap to educate the client. 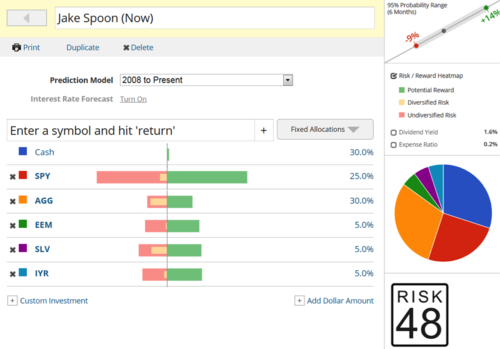 The client’s existing portfolio already carried a Risk Number of 48. The advisor duplicated the portfolio and built a new target portfolio to show the client exactly what moving another 10% of his holdings into silver would do to the risk in the portfolio. Sure enough, the portfolio’s Risk Number would escalate 10 points to a 58, and the downside risk would escalate from 9% to 12%, which was definitely outside of the client’s risk tolerance. With the ability to visualize this additional risk, the client understood why even the upside of more silver wasn’t the right fit for his overall financial situation, and agreed to hold off on any changes for now. Ultimately, clients will do what clients will do, but Riskalyze is empowering advisors to quantify and demonstrate the effects — helping clients to understand exactly why they’re making a recommendation or advising for or against a course of action.